Our members are dedicated and hard working. Day in and day out, we provide the services that make the City of New York one of the best in the world. Our members care for the sick, the children, the elderly. We maintain bridges, parks, roads and subways. We staff the hospitals, schools, libraries, social service centers and city colleges. We do the clerical work, the maintenance work, the technical work that keeps this city running. Our state members uphold rent regulations and serve as interpreters and reporters in the courts. Some of us wear uniforms, some of us wear hard hats, some of us use computers or calculators. United in District Council 37, we are a mighty and powerful force to be reckoned with. 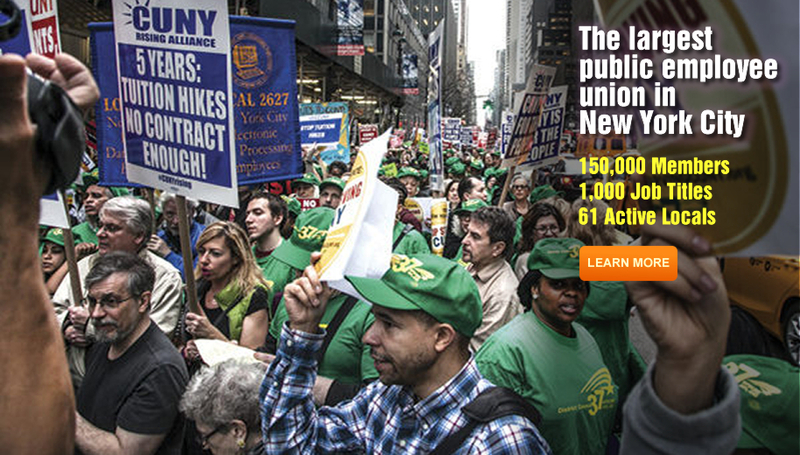 We’re also part of AFSCME— the American Federation of State, County and Municipal Employees— with more than 1.6 million members like us nationwide. DC 37 is about improving our members’ lives on the job and in their communities. We believe social justice is a union issue. Through activism and coalition-building, DC 37 is reaching out in the communities of this city to fight for a better future for our members and our children.